We all know very well that the tech giant Apple’s new cheap iPhone, of course, I am talking about the all-new iPhone Xr continues to surprise. Yes, now according to the latest reports, the tech giant Apple’s cheap iPhone XR beats Samsung Galaxy Note 9 with 8GB of RAM. The tech giant Apple’s new cheap iPhone, of course, I am talking about the all-new iPhone Xr continues to surprise. Yes, it is the most cheaper Apple iPhone of the new 2019 family launched by the tech giant Apple, however, due to its technical characteristics and software, it competes without any problems with the best of the high range devices. A few days ago, the tech giant Apple’s iPhone Xr started to compete with the flagship smartphone of the South Korean giant, of course, I am talking about the all-new Galaxy Note 9 with 8GB of RAM, in order to know which had the best performance in the battery, and surprised practically by simply giving the same time. 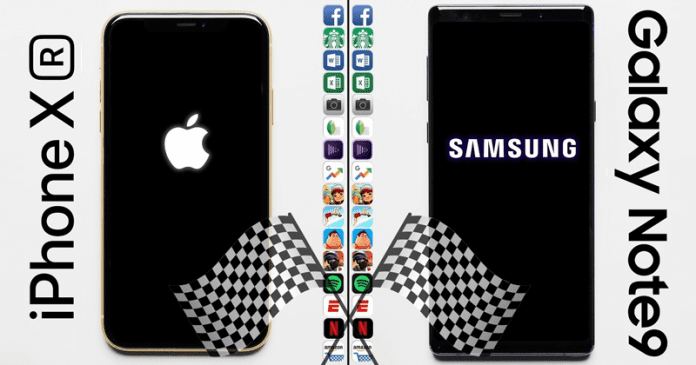 Now, while they are standing face to face to compete each other shows some surprising results, as both the smartphones offer the best performance when opening applications of all kinds. The well-known YouTube channel, of course, I am talking about the PhoneBuff whose test consisted of two stages, basically. In the first, 16 apps and games are opened and run, and, surprisingly, the all-new smartphone of the tech giant Apple, of course, I am talking about the iPhone Xr which seems to be the best competitor. While in the second phase, the applications open in reverse order simply to check that they are still running, and the South Korean giant Samsung’s flagship smartphone, of course, I am talking about the Galaxy Note 9 is recovered and almost beats the Apple’s all-new iPhone, of course, iPhone Xr. However, we all should note one thing that the South Korean giant Samsung’s Galaxy Note 9 managed to beat the all-new iPhone Xr of the tech giant Apple simply due to its huge RAM (8GB RAM). While the iPhone Xr records a time of 2 minutes and 38.33 seconds, the phablet of the South Korean giant, of course, Samsung Galaxy Note 9 managed to achieve 2 minutes and 38.48 seconds, so the well-known YouTube channel, of course, PhoneBuff says that it is a tie. Moreover, undoubtedly, these two smartphones come with remarkable technical and price differences, but that seems to offer a similar user experience and performance. So, what do you think about this? Simply share all your views and thoughts in the comment section below.